Uh-oh. A major red flag for consumers should be indifference to us facing what could be the second highest sales tax in the nation on May 6. As part of Proposal 1, the May 5 ballot issue that would raise the state’s sales tax [16.7%] from 6 percent to 7 percent, commercial truck registration fees would rise between $100 and $1,000 per vehicle, depending on gross weight. The plan also would end a gradual reduction in registration fees — averaging $40 a year — granted on new passenger vehicles during the first three years of ownership [and loss of federal itemized tax deduction]. The higher fees for commercial trucks would immediately raise $50 million a year, while the fee change for new passenger vehicles eventually would raise an additional $125 million a year. The extra fees on commercial carriers would be on top of a stiff diesel fuel tax hike also connected to the plan. Despite that, Michigan’s leading trucking association supports the governor’s roads proposal. “We’re comfortable with the package, but we’re not out there waving the flag,” said Walter Heniritzi, executive director of the Michigan Trucking Association, which has represented motor carriers in the state since 1934. Truth be told, Mr. Heniritzi is a small lobby player in this matter so, his go with the flow mentality should be no surprise. 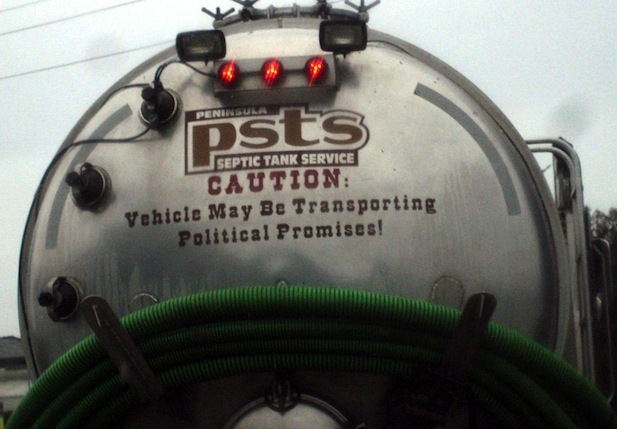 He knows whatever is levied onto the trucking industry is passed along to the consumer. The big players will survive, and the smaller operations will go away or, be consumed by the big corporations as they have historically. Think not? Well, let’s talk for a moment about Prop 1’s “stiff diesel fuel tax hike” for a moment, shall we? OK, just take in what has evolved over the past half decade due to Greentardism™ lunacy. ULSD is a clean-burning diesel fuel that is defined by the Environmental Protection Agency to have a maximum sulfur content of 15 parts per million (ppm). It was gradually phased into the market between 2006 and 2010, replacing the on-highway diesel fuel, known as Low Sulfur Diesel (LSD), which can have as much as 500 ppm sulfur content. In 2010, on-highway diesel fuel was 100 percent ULSD. ULSD is required for use in model year 2007 and later vehicles, which are equipped with advanced emissions control systems. There are enormous environmental benefits to ULSD, but there are also logistical challenges. Special care was required when transporting both types of diesel fuel during the transition. This included pipelines, bulk terminals and tankers. A batch of ULSD that has even slight contamination with LSD could lead to significant fines if the batch of ULSD exceeded a certain level. In addition, to produce ULSD the refining industry had to invest approximately $8 billion in infrastructure upgrades and the daily production costs for ULSD are higher than LSD, since the fuel requires more refining. This influences the cost of all diesel and results in a premium for ULSD, which is estimated to add about 10 cents per gallon to the cost of diesel fuel. The final factor in why diesel fuel prices are higher is taxes. The federal tax on diesel fuel is 6 cents more than gasoline per gallon (24.4 cents vs. 18.4 cents). The last increase in the federal tax was in the early 1990s, back when diesel fuel was usually less expensive than gasoline. Taxes do not factor into why diesel fuel prices are higher than gasoline today ” strong demand and USLD are the causes ” but taxes are a factor in overall prices. Yep. Government mandated Ultra Low Sulfur Diesel for both on-road and non-road use, which has had it’s own self-inflicted consequences on farmers who once atomized it now have to use more ULSD to apply sulfur fertilizer to their sulfur deficient fields. A classic case of politicians pandering to the cult of dirt-worshiping AGW Enviro-loons, government bureaucrats who bank on them both to keep their paychecks and benefits flowing by the hocus-pocus ideal that less is always more, and the idiocracy of pretending to have control over what that big yellow round thing in the sky does. 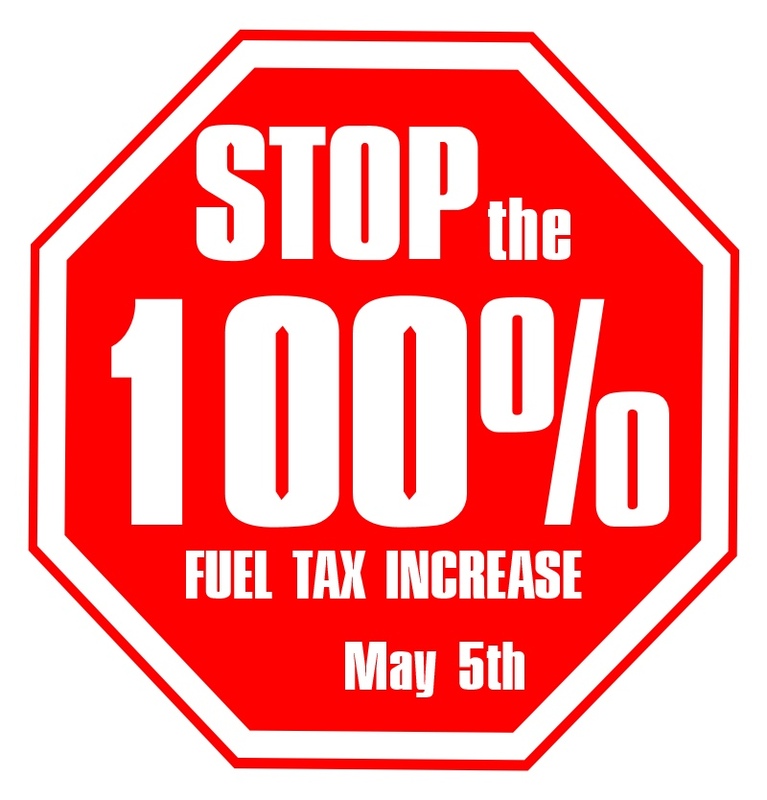 And, once May 6 comes and if Proposal 1 proves to be an epic failure with voters, never forget your Michigan Chamber of Commerce could care less what reckless management and waste happens at MDOT as long as their corporate friends are taken care of by higher taxation on the consumer. Honey pots aren't the only things full of "you know what". Now, here's the thing that I don't get: For a man who bills himself as some kind of financial cracker jack, why Rick Snyder isn't aware of the patently obviously fact that transportation companies WILL be passing along any "new" costs to customers (like we already do with fuel costs when they spike)? That would be the question I'd like to see the meat puppets ask him when he does his next grip & grin in support of his sales tax hike. THIS is the problem with 'hiring' a businessman. Whenever someone says "he'll run the state like a business, I cringe. A business has as its primary goal, a mission to make a profit. I don't want Michigan to make a profit. Add to this the annual gift buying at Christmas for the 'best customers,' and the imitation is complete. It also will grow to accomplish the primary objective. 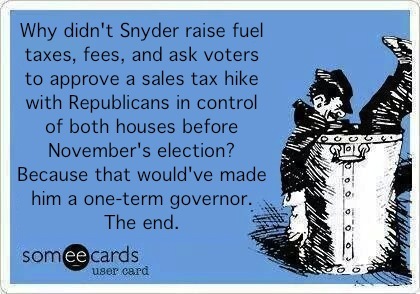 Snyder is a crony "cracker jack." Some business operations simply have 'favored' buyers. They help grow the business.